Join the fun at the ENC’s annual Fall Faire and Pumpkin Patch! Look forward to Pumpkins of all shapes and sizes, native plant sale, delicious food and drinks from local vendors, crafts and games for the kids. The Fall Faire has been an ENC tradition since 1977. Buy a re-usable ENC canvas bag for $5 to participate in the Craft Crawl. Walk along the trails at ENC as the kids go station to station making awesome eco-friendly & nature-inspired crafts! Francisco the Bug Guy and the Orange County Bird of Prey Center will be on hand with their live hawks and owls. Take a ride on a friendly pony or visit a variety of barnyard animals in our petting zoo! Bring the kids and play super fun games, winners can enter to win prizes in our children’s auction. There’s something for everyone! Looking For Something To Do Today? Looking for something to do Today? There’s so much going on, you’re gonna have to choose! Check the Calendar for details. 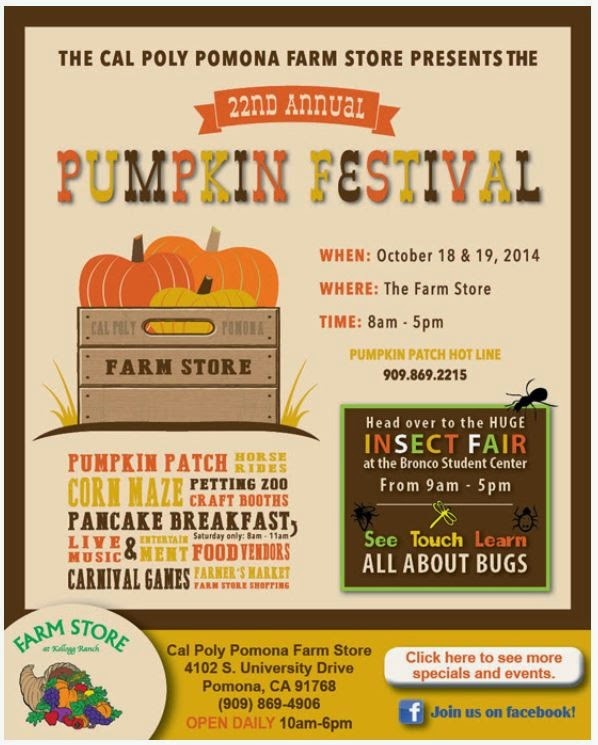 The Pumpkin Festival is a two-day event held every October at the Farm Store at Cal Poly Pomona. The festival draws thousands of visitors to pick pumpkins from a patch near the Farm Store. The College of Agriculture grows 80,000 pumpkins for the event and EVERY pumpkin is only $5.00 each!!!. The festival features a corn maze that is specially grown for the occasion, horse rides, pie eating contest and a petting zoo. Visitors can compete and play games run by student clubs or listen to live music. Food and drinks are available to purchase from vendors. Opening Ceremony begin at 11:00 am on Saturday morning October 17th at the gazebo for a special Opening Ceremony to kick-off the ‘Season of Orange’ Celebrating California Agriculture. There will be live music, festival giveaways and an appearance by the official festival mascot. While your at the Pumpkin Festival make sure to visit the Insect Fair which features nearly 500,000 live and preserved insects (open on Saturday & Sunday from 9am-5pm). Cost: Entrance to the Festival is FREE, Prices vary for individual activities such as the corn maze, horse rides, petting zoo and Insect Fair. No animals are permitted at the pumpkin Festival, this is a cash only event but ATM machines are available. All proceeds support College of Agriculture student clubs and activities, as well as farm operations. The Fall Faire & Pumpkin Patch is everything fall. Pumpkins, food, native plant sales, children’s games, crafts & face painting, live entertainment, story time, petting zoo & animal demonstrations. Bring your appetite for the “Savor OC” restaurant showcase. You can purchase delicious food and drinks from their Restaurant Sponsors: Blue Water Grill,Haute Cakes, Pie Not, Sensitive Sweets, Kean Coffee, Which Wich, the Newport Beach Fire Department, Mi Casa, Shirley’sBagels, Jan’s Health Bar,Pom and Olive, Pangaea Juice, Paige’s Cake Pops, and Ander’s Catering! 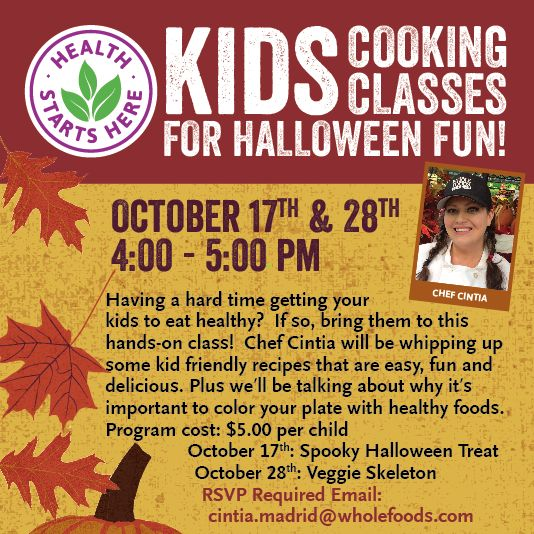 Kids can participate in a variety of fun crafts! Purchase a re-usable ENC canvas bag for $5 – your “ticket” to make awesome crafts like Water Bottle Piggy Banks, Egg Carton Helicopters, Newspaper Hats, Water Bottle Watering cans, Native plants and Toilet Paper Roll Monsters! Saddleback fashion department will be on hand with their fun photo booth, too! The Orange County Bird of Prey Center will be on hand with their live hawks and owls. 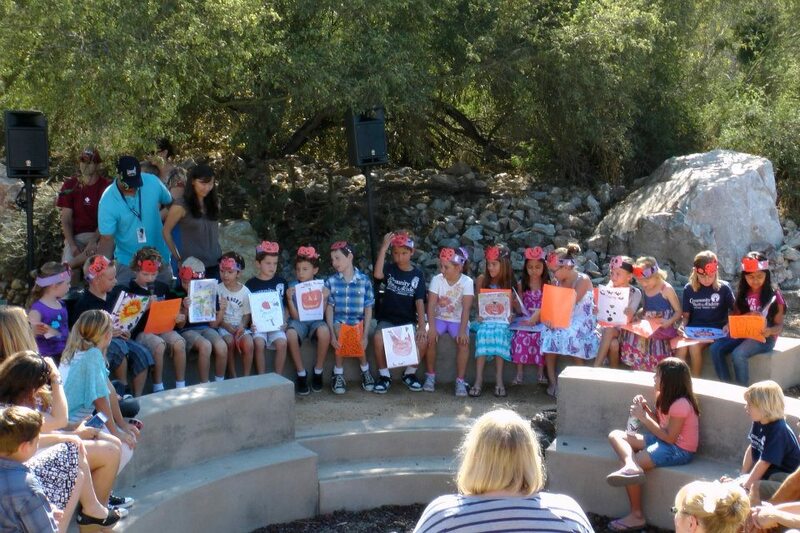 A presentation by the Youth Singers of Orange County, will have kids meet live reptiles and amphibians with Camp Teacher Bob, and live arthropods with Camp Teacher Tami! Participate in the Going Green Game Show with Sama Wareh! Check out the schedule HERE. Time for the Pumpkin Patch! It’s October and that means it’s time to go the Pumpkin Patch! My family had our first pumpkin patch visit of the season this weekend. Irvine Park Railroad invited my family and I to attend the 10th annual Pumpkin Patch. 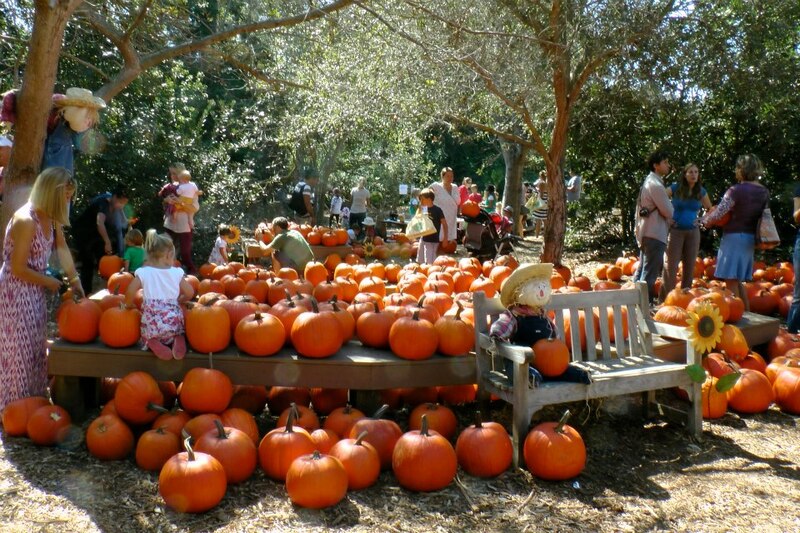 The Pumpkin Patch is located inside of Irvine Regional Park. I always feel as if I am completely outside of the city when I’m here. Attending the The Pumpkin Patch was a wonderful way to welcome in the fall season. When you arrive you see a beautiful display of pumpkins, fall colors and photo ops throughout the park. There’s plenty to do before picking out the perfect pumpkin, my girls were delighted to start the day running through the straw bale maze. game booths (which I love because everyone wins a prize). The hay rides look fun, although due to my oldest daughter’s allergies we can’t go on them. The train ride is always enjoyable and takes you on a ride through the Irvine Railroad Park with views of the lake, peacocks running through the park and families enjoying their afternoon fishing and picnicking. Other things to enjoy are the John Deere tractor racers, panning for gold (that was fun), bounce houses, a kid friendly (and mommy friendly) haunted house, cookie decorating, face painting and a lot of great photo ops. What I love about Irvine Park Railroad is that it’s free to enter. You do have to pay to to enter Irvine Regional Park ($3.00 weekdays, $5.00 weekends). Some of the activities do require a fee but things such as the hay bale maze. the haunted house and all the photo ops are FREE. The pumpkins are gorgeous and reasonably priced. While your at Irvine Regional Park take advantage of the day, visit the Interpretive Center, go for a hike one of the many trails, visit the OC Zoo, play at one of the four playgrounds or rent a bike or a paddle boat from Wheel Fun Rentals. Irvine Regional Park has plenty of picnic benches, so pack a lunch or visit the Lakeside Snack Shack for a quick lunch. When: Open daily (weather permitting) at 10:00 am through October 31st. Cost: Entrance into Irvine Regional Park is $3.00 on weekdays, $5.00 on weekends, Entry into the Pumpkin Patch is FREE, some activities have fees that vary according to activity. Activity tickets are $5.00 each or buy a book of 15 tickets for $60.00 ($15.00 savings). Don’t forget to print these coupons before you go. Disclosure: Irvine Park Railroad provided complimentary tickets for me and my family to take part in the media weekend. My opinions of the event are entirely 100% my own and in no way had any impact on my review. There’s only 4 days left to enter the Giveaway from Irvine Park Railroad to the 10th annual Pumpkin Patch!!! This is one of ways my family welcomes in the Fall season. So here’s your chance to win the chance to experience thousands of pumpkins, in all shapes and sizes, filling the areas behind the train station. In addition to choosing the perfect pumpkin you are family can look forward to riding the train, panning for gold, face painting, a pumpkin moon bounce, hay rides, and more. Here’s your chance to win a Family 4 pack, valued at approximately $70.00, courtesy of Irvine Park Railroad. Irvine Park Railroad’s Pumpkin Patch will be open: September 19 through October 31, 2015, from 10:00 am – 5:00 pm on weekdays and 10:00 am – 6:00 pm on weekends. Parking fees for Irvine Regional Park are $3.00 per vehicle on weekdays and $5.00 per vehicle on weekends. Enter now – Good Luck!!! AMY – please email me your full name & address. Your prize will be mailed to you directly from Irvine Park Railroad. Thanks to fine folks at Irvine Park Railroad – It’s Giveaway time for their 10th annual Pumpkin Patch!!! For me and my family, this event welcomes in the season. Each year thousands of pumpkins, in all shapes and sizes, fill the areas behind the train station. In addition to choosing the perfect pumpkin you are family can look forward to riding the train, panning for gold, face painting, a pumpkin moon bounce, hay rides, and more. 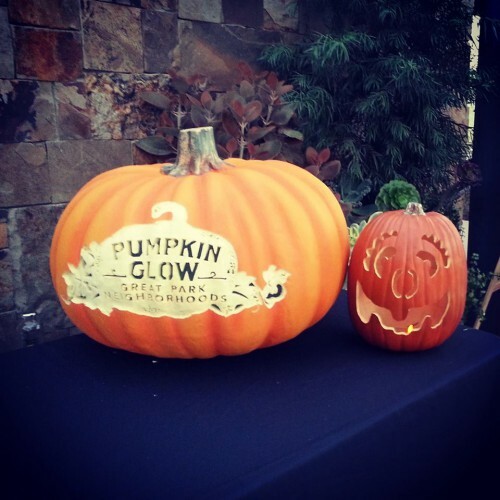 There’s tons of Halloween fun to be had in this Weekend Roundup. This Weekend’s Roundup is packed with some great choices for Halloween fun! The 20th Annual Pumpkin Festival at Kidspace Children’s Museum is Saturday, October 18 & Sunday, October 19, 2014 from 9:30a.m. to 5:00p.m. This family-friendly event includes fun for all ages and will be hosted in Brookside Park, directly in front of Kidspace Children’s Museum. Kids will giggle with delight at the petting zoo, pony rides, exciting bouncers, carnival games, and seasonal crafts. Partake in a costume parade, make your own take-home fall crafts, enjoy face painting, and select pumpkins from our pumpkin patch. The parents will love the book and costume sale, and tasty picnic treats. Festival admission is FREE – as well as the live music/performances, selected crafts, promotions at the Radio Disney tent, and a photo opportunity at the pumpkin patch. There is also plenty of FREE parking in Lot I of the Rose Bowl adjacent to Brookside Park. Tickets are available for purchase to enjoy the bouncers, pony rides, games, food, and many other festival attractions. The annual Pumpkin Festival is organized by the museum’s volunteer support group, The Circle of Friends, and offers even the youngest children a fun and safe way to celebrate the season. All proceeds benefit Kidspace Children’s Museum.